On his second full-length with his studio band The Gossamer Wings, Pete Krebs, known for his work in the Northwest post-punk outfit Hazel and his alt-bluegrass group Golden Delicious, ups the ante. Recording his swan song prior to moving to Amsterdam, where he went to expand his chops and increase his musical abilities, Krebs delivers an album that will seal his legacy as one of the greatest NW songwriters of all-time. 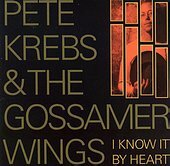 I Know It By Heart, the album he had in the can prior to moving overseas in the spring, which is being released October 8th, finds Krebs at the top of his game, dabbling in Americana, rock 'n' roll, and heartening pop. "Her Dress So Green in Midnight", Krebs' pop ballad, is a fine example of the smart, mature songwriting he is able to create without abandoning the gripping emotions or the urgent feelings of his post-punk beginnings. A song about love and passion, Krebs is able to evoke sweet memories of the unbridled passion from your own relationships. All so casually you don't even know he's done it until after the record is finished and you're still thinking about that 2am kiss in the rain and the song you heard Krebs sing that you now attach to that memory. "Kid Domino" is a late-night, street walking pop-rock piece that heeds the warning "slow down, all you're doing is acting stupid", while the opening track, "Sleeping Beauty," offers up a shuffle dance beat, hook-laden melodies, and plenty of "ba, ba, ba's" for you to hum and sing along with. The latter is Krebs at his finest, crafting the perfect pop song, one that has enough rock prowess and pop ambitions to win you over without even trying. Let's not forget the title track, an Americana pop song complimented with a lush organ tone, or the jangle-y "Cela", an infectious sing-along that will find you harmonizing with Mr. Krebs. "Distant Lights", "Carolina", the solo acoustic "Moon and Stars", reminiscent of the acoustic pop found on Krebs' Bittersweet Valentine EP, and the sweet melodies of "Shades of Midnight Blue" are even more reasons you'll fall in love with Krebs' best work to date. I'll give it an A+.